Rat anti Mouse Lymphotoxin beta Receptor antibody, clone 5G11b recognizes murine lymphotoxin-beta receptor (LT beta R), a member of the tumor necrosis factor family. 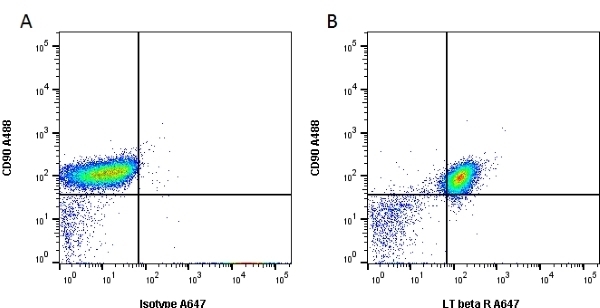 LT beta R is primarily expressed on stromal cells and fibroblasts and at lower levels on myeloid cell lines. Rat anti Mouse Lymphotoxin beta Receptor antibody, clone 5G11b recognizes surface expressed LT beta R.
Rat anti Mouse Lymphotoxin beta Receptor antibody, clone 5G11b is reported to be agonistic with respect to NF Kappa B activation, MIP-2 induction and IL-6 release (Hehlgans et al. 2003). Rat anti Mouse Lymphotoxin beta Receptor antibody, clone 5G11b is routinely tested on WEH1 cells. Recombinant extracellular domain of LT beta R.
Spleen cells from immunised Wistar rats were fused with cells of the SP2/0 - Ag14 mouse myeloma cell line. Hehlgans T et al. (2003) Activation of the lymphotoxin-beta receptor induces NFkappaB-dependent interleukin-6 and MIP-2 secretion in mouse fibrosarcoma cells. Eur Cytokine Netw. 14 (2): 103-7. Palumbo, M.O. et al. (2006) Isolation and characterization of proinsulin-producing medullary thymic epithelial cell clones. Moore, F. et al. (2007) An alternative pathway of NF-kappaB activation results in maturation and T cell priming activity of dendritic cells overexpressing a mutated IkappaBalpha. Magari, M. et al. (2011) IL-21-Dependent B Cell Death Driven by Prostaglandin E2, a Product Secreted from Follicular Dendritic Cells. Muller, P. et al. (2001) Functional characterization of the mouse lymphotoxin-beta receptor promoter. Eur Cytokine Netw. 12 (2): 325-30.